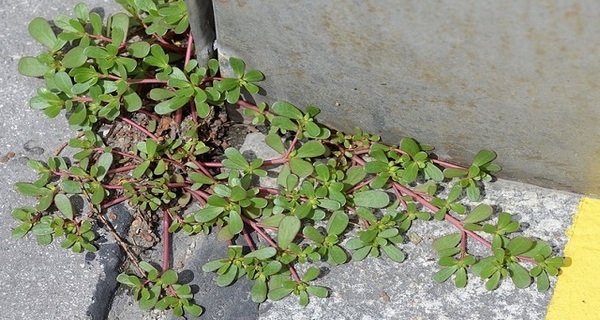 Portulaca oleracea, better known as Purslane, is a common weed that you can probably find in your own garden. This plant first existed in Persia and India and now it has spread throughout the entire world. In some countries this weed is cultivated and it is used as food, while in others it is just a common weed that is thrown away with other weed and leaf clippings. This weed often has yellow flowers and fleshy leaves. Therefore, it is especially attractive weed. However, the healing qualities of this weed are the important characteristics that should be known. The seeds of this weed are very powerful and in land they can remain viable for 40 years. Moreover, this plant is not GMO. It is completely natural. Purslane can grow in both arid climates and well-tended gardens. The crop will grow equally well in both of these circumstances. This powerful, resistant and healing plant is especially beneficial for the immune system and the overall health as well. This weed is also called pig weed and it is certainly better feed for pigs than the GMO grains used by most farmers for pig and other livestock feed. Amazingly, the purslane weed contains more omega 3 fatty acids than most fish oils. Furthermore, it has one of the highest levels of vitamin A among the leafy green vegetables. Vitamin A is excellent for boosting the health of the eyes and it is also a marvelous protector from several types of cancer. Purslane is loaded with two types of betalain alkaloid pigments called yellow beta-xanthins and reddish beta-cyanis. Both of these pigments are stong anti-mutagens and antioxidants. This weed is also rich in vitamin C, vitamin B-complex including niacin, riboflavin and niacin, carotenoids and trace minerals such as calcium, magnesium and iron. To conclude, purslane offers many nutritional benefits and it should be considered as a booster of the health instead of a simple weed, especially because we spend a lot of money on health supplements.